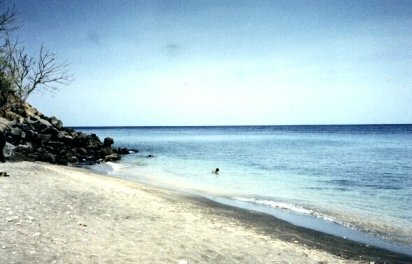 Have you been to Amed? I'll tell you now, there is absolutely nothing to do there but swim, snorkel, sunbake, sleep, eat and spend quality time with your partner/ family. Really romantic and relaxing. The coral reef is not too amazing, as apparently El Nino killed it off a couple of years back, but it is growing back, and still pretty awesome. There are heaps of fish too - hundreds of different species, all brightly coloured and beautiful, from really tiny up to quite big. The place we stayed was called Good Karma Bungalows. It's actually in Selang, which is further south along the coast road, past Amed, Jemeluk, and Lipah, just before Blue Moon Villas (which are up on the next hill - great views but more expensive). Good Karma is situated on its own little beach/ bay, there is a Balinese village at one end, and a tribe of the village kids play on the beach and swim every afternoon after school. 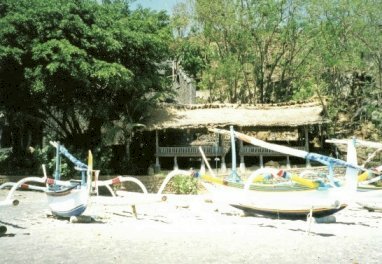 Like all the beaches in the area, the beach is covered in colourful wooden jukungs (fishing boats) which the village fishermen take out, at dawn and dusk. It's great to feel like you're sort of immersed in village life, without the whole tourist shamozzle - these guys just get on with their lives. There are a few ladies from the village who hang around and offer massages, but they aren't at all pushy. 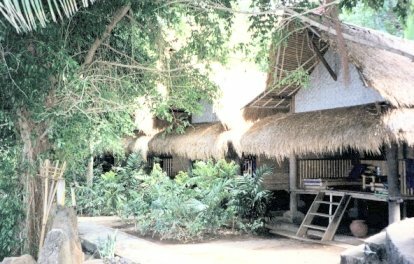 There are 18 thatch roofed wooden bungalows at Good Karma, some are 2 storEy with 2 single beds downstairs and a double bed upstairs, good for families. These are $US18-25 per night. 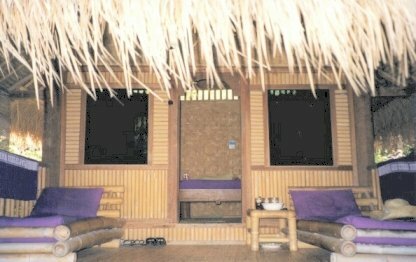 The single storey bungalows are $US10 per night, for 2 people, and this includes breakfast for 2. 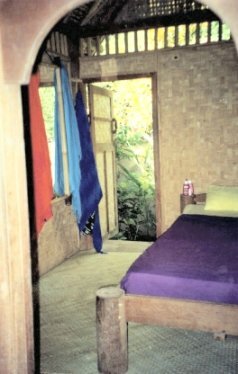 You can pay in $US or in rupiah like we did - the rupiah rate is 100.000 rp per night, for a double. The bungalows are right on the beach (the water is 20m away). These have 2 day beds on the front porch, and then a double bed inside, with mosquito nets, a ceiling fan. and electric lights. The restaurant is quite good, also right on the beach, so it's a lovely setting, the meals are a bit uninspired (not real exciting - lots of noodles and fish) but not too expensive (around 12,000 to 25,000 rupiah). The bungalows are set amongst shady gardens which keeps things nice and cool (the Amed area is pretty dry and hot). 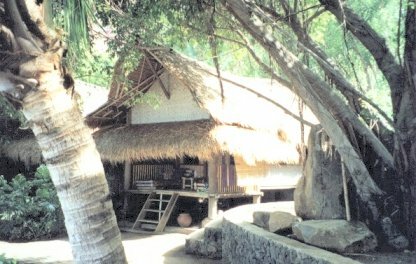 There are 2 big open bales at the end of the beach, facing out to sea/ Lombok, with bamboo windchimes and cushions on the floor, where you can eat your meals, or read, or just sit and watch the ocean. It's truly like you imagine a tropical island paradise to be. 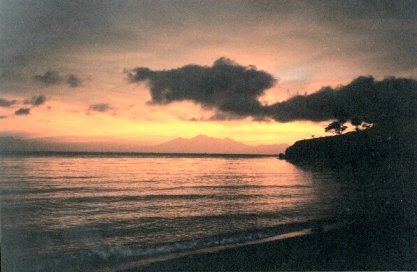 Sunrise is spectacular, as the sun rises behind Mt Rinjani on Lombok, and the whole horizon is dotted with the sails of the fishing boats as all the village fleets set sail for the morning's catch...the fishing fleet goes out again in the late afternoon, and then returns after sunset. You wake each morning to the sound of a cacophony of roosters, and the fishing boats being launched, and go to sleep at night to the sound of waves breaking onshore, and geckoes in your roof. At night the stars are really bright, and it's peacefully quiet - except for the ubiquitous howling dogs and the nearby village noises. Good Karma don't have any contact details - they told us, not even a phone number - so you can't make a reservation - just turn up. 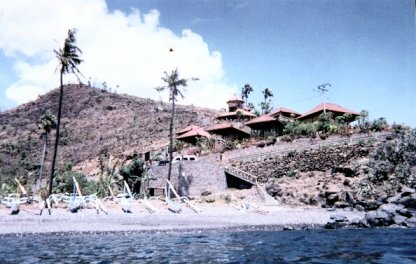 If Good Karma is booked out, there is another great place called EKA PURNAMA, further along the coast, past Blue Moon Villas. This is also 100.000 rupiah per night for 2, with breakfast. They have just 4 bungalows and a great restaurant, situated up on a hill, fantastic views and ocean breezes, overlooking the best snorkelling spot (in my opinion) on the coast. There is another newish place closer to Amed itself, which is called WaWa WeWe II - which we didn't get the prices of, but it looked pretty good too. WaWa WeWe I is a good place to eat (great food), but the cottages there are not near the water, and face right onto the restaurant (although they are cheap at about 60.000 rupiah). We hired a car to get to Amed, which we found useful to get to other restaurants, and snorkelling sites. But if you use a driver to get to Amed and don't have a car or your own transport, then the guys at your hotel can arrange to take you places on the back of their bikes, or drive you. And they can arrange for a driver to take you back to the southern part of Bali as well. To get to the Amed area, head for Culik via Candidasa, Amlapura and Tirtagangga, turn right at Culik, then drive through villages etc for quite a way, towards the coast. Then you turn left, onto the coast road, for Amed/Lipah/ Selang etc. There will be heaps of signs advertising all the properties and the dive schools - just follow the signs to Eco Dive/ Coral View/ Hidden Paradise/ Blue Moon Villas/ Santai etc - and keep going. You will then come across most of the other places to stay - Santai, WaWa WeWe I and II, Pondok Vienna, Coral View, Dancing Dragon etc etc etc. If you don't see anything here that you like the look of (and most of these places are great too), just keep driving! The best way to find Good Karma (there aren't many signs pointing the way) is to just keep following the signs to Blue Moon Villas, and then just before you get to Blue Moon Villas, you will come over a hill and as you head down, Good Karma will be on your left, nestled into the bay. 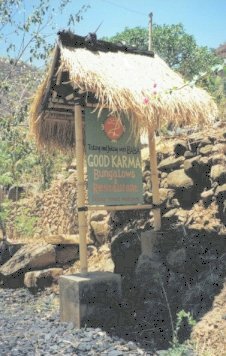 You'll see a high rock wall (the wall of a temple that Baba, the owner, is building) and a tree-shaded driveway, and there will be a sign on your right opposite the driveway, saying "Good Karma". If you get to Blue Moon Villas you have gone too far - it's situated on the headland just past Good Karma (you can see it from the Good Karma beach). Baba also has another property 'Reincarnation', similar to Good Karma, a bit further south as well, heading towards Eka Purnama, which is the furthest property south.